Help support Mike: Bookseller and get cool stuff like giraffe drawings or a spot in the strip! Nine more patrons by the end of July and I’ll draw an extra comic! We’ve had some signs get shipped to us with some pretty egregious typos throughout the years. 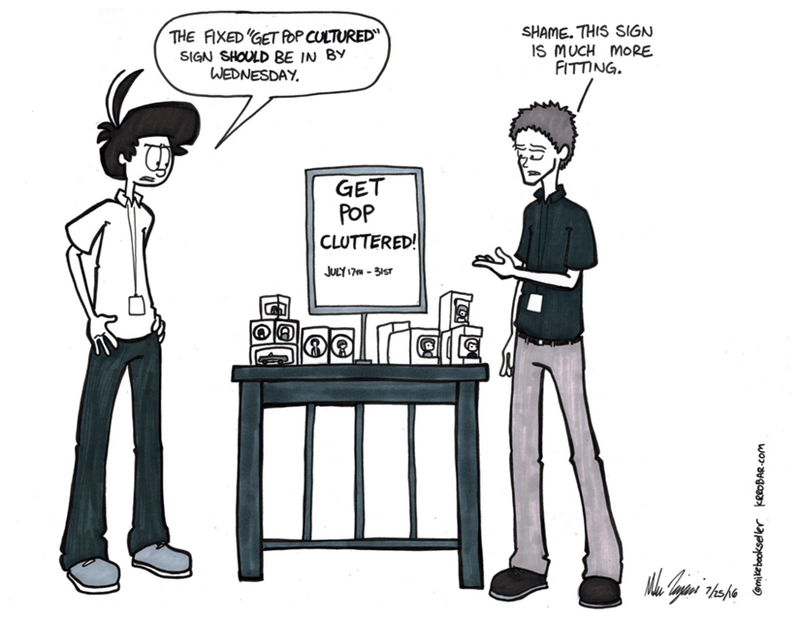 Just recently I’ve seen evidence of the “Get Pop Cultured” event promotions suffer from the fate of bad copy editing. Cluttered is the best way to describe this years exclusive stuff that The Bookstore carried and having those products spoiled ahead of time by someone didn’t help much either. I don’t think people are going to care too much about Snoopy painted up as the American flag or the Peculiar Purple Pie Man from Strawberry Shortcake. I could be wrong. Maybe we sold out the minute I left the store when my shift ended. I won’t really be surprised if those Pop figures are still sitting on the display when I come back into work though.